The cybersecurity threat landscape has never been more extensive and is most likely to grow exponentially in 2018. Although the original creators of Mirai DDoS botnet have already been arrested and jailed, the variants of the infamous IoT malware are still in the game due to the availability of its source code on the Internet. Security researchers have spotted a new variant of infamous Mirai IoT malware designed to hijack insecure devices that run on ARC embedded processors. Until now, Mirai and its variants have been targeting CPU architectures—including x86, ARM, Sparc, MIPS, PowerPC and Motorola 6800—deployed in millions of Internet of Things (IoT) devices. 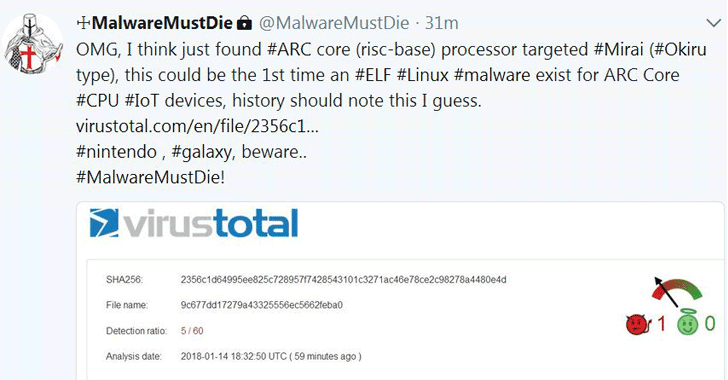 Dubbed Okiru, the new Mirai variant, first spotted by @unixfreaxjp from MalwareMustDie team and notified by independent researcher Odisseus, is a new piece of ELF malware that targets ARC-based embedded devices running Linux operating system. "This is the FIRST TIME ever in the history of computer engineering that there is a malware for ARC CPU, & it is #MIRAI OKIRU!! Pls be noted of this fact, & be ready for the bigger impact on infection Mirai (specially #Okiru) to devices hasn't been infected yet," Odisseus tweeted. ARC (Argonaut RISC Core) embedded processor is the world's second-most-popular CPU core that's being shipped in more than 2 billion products every year, including cameras, mobile, utility meters, televisions, flash drives, automotive and the Internet of Things. However, this isn't first Mirai botnet variant based on Linux ELF malware. Mirai also has another ELF-based variant, which was designed to target devices running MIPS and ARM processors. It should also be noted that Okiru, which has previously been also named as Satori IoT botnet (another Mirai variant discovered late last year), is "very different" from Satori despite having several similar characteristics, as explained in a Reddit thread. IoTs are currently being deployed in a large variety of devices throughout your home, businesses, hospitals, and even cities (smart cities), but they're routinely being hacked and used as cyber weapons due to lack of stringent security measures and insecure encryption mechanisms. If you are unaware, the world's largest 1 Tbps DDoS attack so far was launched from just 152,000 infected IoT devices using Mirai botnet, and in a separate attack, just 100,000 devices took down the popular DynDNS service in late 2016. Since Okiru has been ported to target a new range of millions of "expectedly insecure" devices running ARC processors, the DDoS attack going to be generated by Okiru botnet would probably be the biggest cyberattack ever. "From this day, the landscape of #Linux #IoT infection will change. #ARC CPU has produced #IoT devices more than 1 billion per year. So these devices are what the hackers want to aim to infect #ELF #malware with their #DDoS cannons. It's a serious threat will be," Odisseus tweeted. 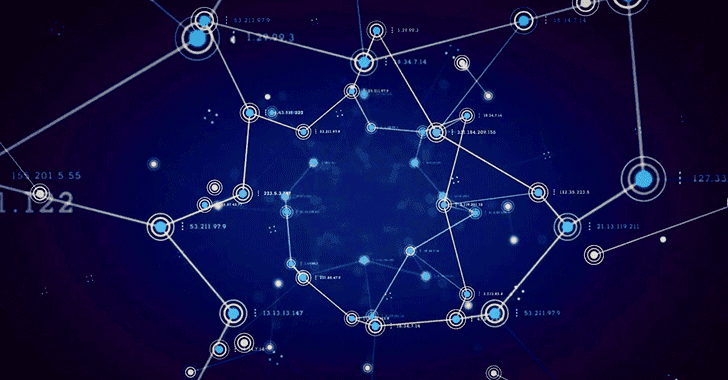 The fresh arrival of ARC-based IoT devices into botnet scheme will exponentially raise the number of insecure devices to an unprecedented size, making it easy for hackers to gain control over a large number of poorly configured and vulnerable IoT devices.